I purchased a new toy in March. I acquired a Carson zOrb 65x Digital Microscope. Although not a tool for advanced photographers, I hoped that it would give me a simple tool for illustrating details I could not depict well with my Nikon. And for $50 I decided it was worthy of an experiment. 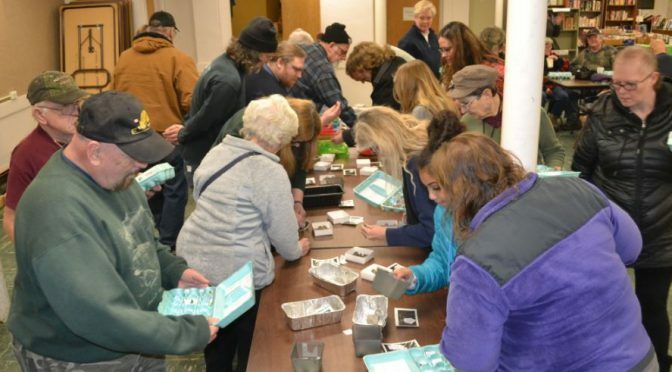 The meeting room was crowded for our February meeting as 49 members showed up to build their own egg crate mineral collections from the club’s inventory of small stones, mineral specimens and fossils. There were over 50 options to chose from when the first selections were made. On occasion, cleaning out that old box of leftover and generally forgotten minerals from a past trip can provide an unexpected reward. Last month I uncovered a box of rather ordinary wavellite specimens from the club visit to Mount Pleasant Mills, PA in April of 2016. Among the cruddy and generally less than desirable wavellite discards I found a fossil gastropod that I had remembered collecting, but had pretty much forgotten. It was time to clean it up and do a little research. After all, that is what the winter months are for in western New York. 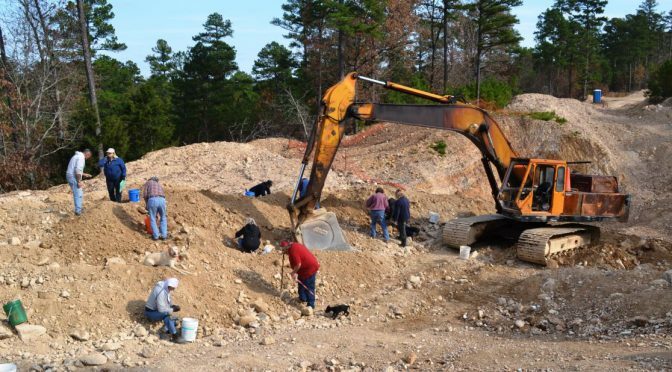 Some rockhounds like to collect rocks and minerals the size of small cars, or at least motorcycles. You know who you are (and so do the rest of us!). Others settle for samples that can be carried, a size that seems to decrease with each collecting season. But we also know of those who collect thumbnail specimens (less than 1”) and stick them into tiny boxes. There are even folks who like to collect specimens that require microscopes to be seen; these collectors are called micromounters. 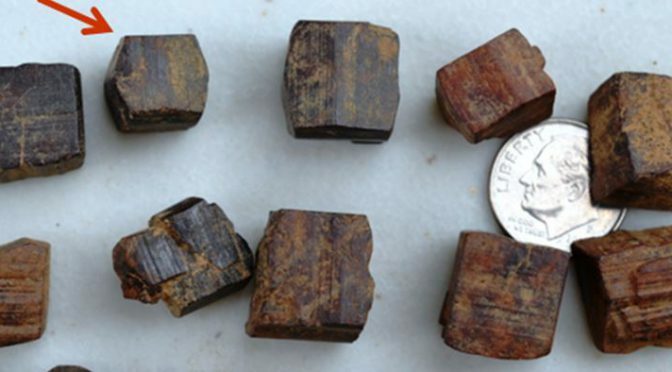 But I am going to tell you a bit about some “mineral specimens” that are even smaller. And I am even going to make up a new name for them. 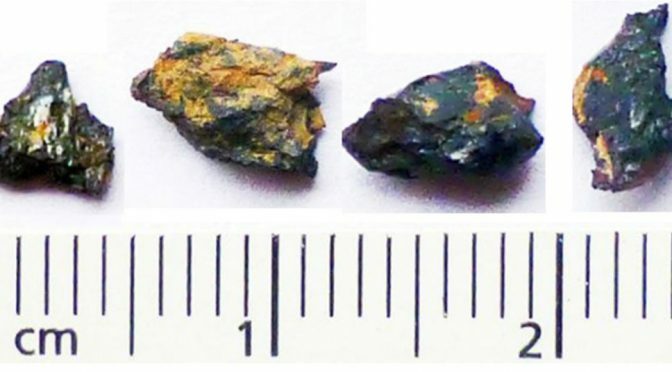 I am calling them micro-micro minerals. Topical or thematic stamp collecting is a tremendous way to diversify and expand one’s special interest. For me of course, this takes me to minerals, fossils, geology. etc. and the thousands of worldwide stamps carrying such images. 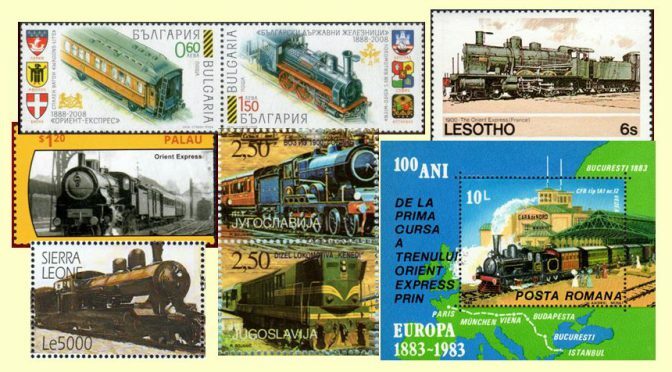 But another collector in the Rochester Philatelic Association (RPA) with an interest in trains and the use of the railroad in postal history took his topical collecting in a different direction. The following is a review of his presentation to the Rochester Club in January. In winter I spend a little time with my second hobby: philately. 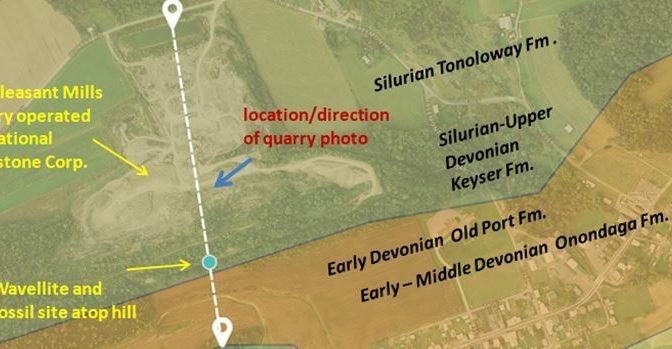 In addition to topical stamps bearing minerals and fossils, I also like to learn about forgotten and defunct places. Often stamps help tell that story. 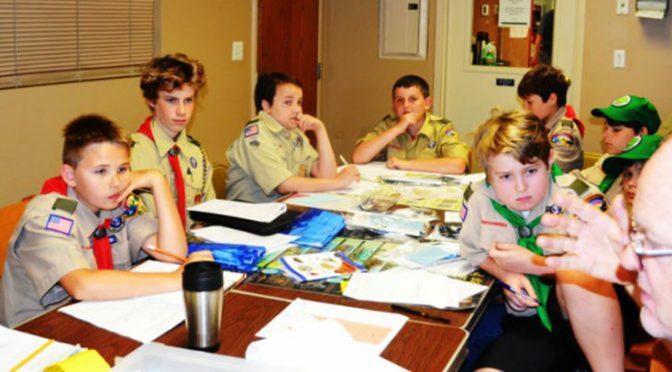 I am not alone with this interest among members of the Rochester Philatelic Association. In October of 2015, Steve Eisinger entertained us with his presentation entitled “Confusing, Obscure, Bizarre and Defunct Countries – Their Coins and Stamps”: fascinating stories about forgotten places. And now, for all of us who enjoyed Steve’s presentation, there is a new philatelic book with the same theme. “Nowherelands- An Atlas of Vanished Countries 1840-1975” reviews the history and geography of some 50 vanquished countries through the eyes of the country/kingdom’s stamp issues. 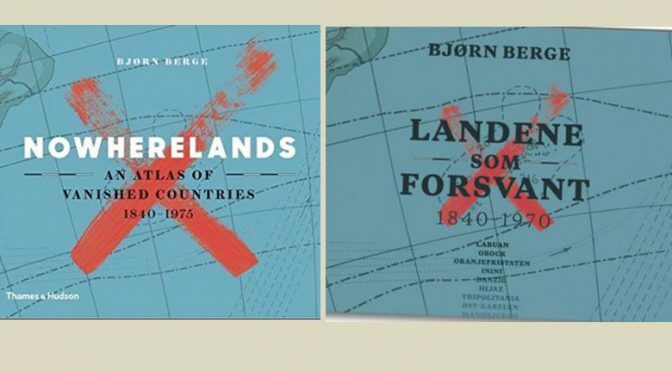 The author, Bjorn Berge, is a Norwegian philatelist with a keen interest in history, a tireless commitment to research, and a ability to craft a relevant and enjoyable story. The book was first published in Norwegain in 2016 with the title Landene som Forsvant. In late 2017, an English translation became available online. 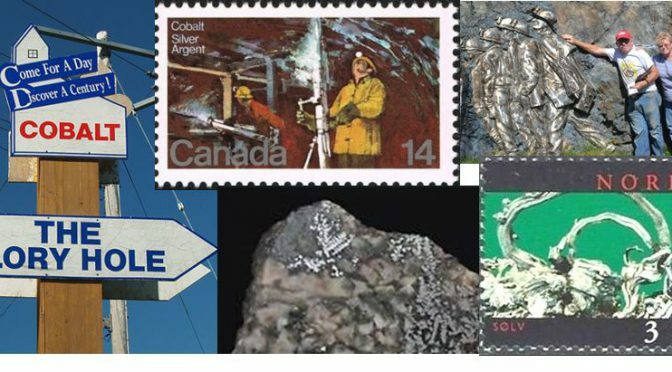 Bjorn Berge notes in his introduction, “The stamps serve as the core evidence, providing concrete proof that the countries did in fact exist.” Countries such as Karelia (now part of Russia) that existed only for 17 days in 1922. Not much time to form much of a government, but apparently enough time to issue a postage stamp (heck 15 of them! ), thereby insuring its immortality, at least to philatelists. Or the Kingdom of Two Sicilies which united the Kingdoms of Sicily and Naples from 1815-1860 and issued a set of stamps depicting the kingdom’s coat of arms stamps in 1858. And then there is Inini, Biafra, Nandgaon, Obock, Upper Yafa, and this list goes on. Each entry includes a map, a bit of history, and the story behind the designs of the stamps. On the left: Scott #4 from Karelia (one of 15 stamps issued in early 1922). The raging bear breaking free of its chains depicts a republic willing to defy the Russians in establishing an autonomous country. Starvation and a frostbite cut the rebellion short. Those scribbles above the bear’s head: those are the northern lights! On the right: Scott #3 issued in 1858 by the independent kingdom of Two Sicilies. The book received a positive review by Phillip Coop in the January 2018 issue of The New CartoPhilatelist, the journal of the ATA Study Unit of Maps on Stamps, and by Angela Riechers in the online October issue of Print Magazine. The 200 page book can be obtained from Amazon online for less than $20. Having collected stromatolites in several locations in New York and Ontario, I was attracted to a small polished piece offered this past October by a dealer at the Rochester Gem and Mineral show. 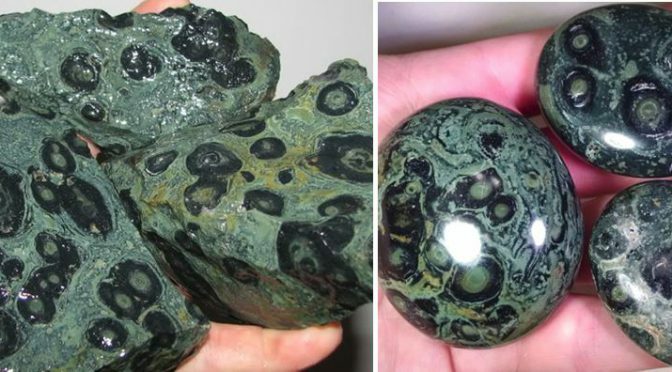 It was labeled Kabamba Jasper – stromatolite, Madagascar. 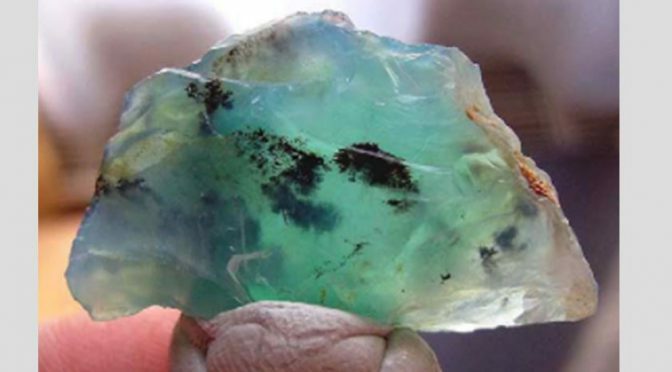 It was a pretty green color, showed physical characteristics of a stromatolitic origin, and best of all, it was reasonably priced. I bought it and came home to research the geology and age of my new find. Immediately, things got complicated. 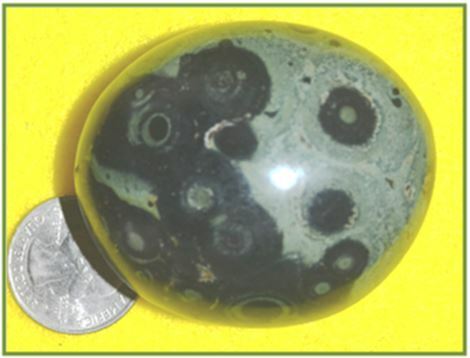 My polished piece of Kabamba Jasper – Madagascar: But is it really of biologic origin? 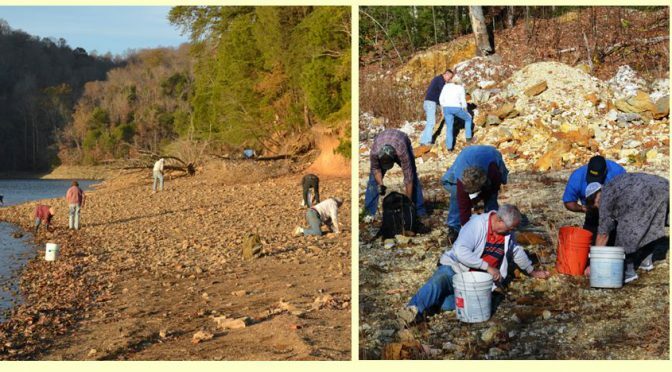 In November of 2017, Wayne County Gem and Mineral Club undertook a 9 day collecting trip to Arkansas-Tennessee-North Carolina. This is mostly a photo essay from the first half of the trip in the Arkansas quartz district of Mt. Ida and Jessieville. Published in WCGMC December 2017 newsletter. Part II on the rest of the trip will follow. 3300 miles and 3300 pounds of Arkansas quartz: the miles are accurate, but the weight may be a bit of an understatement. Once someone started putting large clusters and quartz-covered pieces into the trailer (I think it was Glenn!) it seemed contagious. Everyone simply needed more! 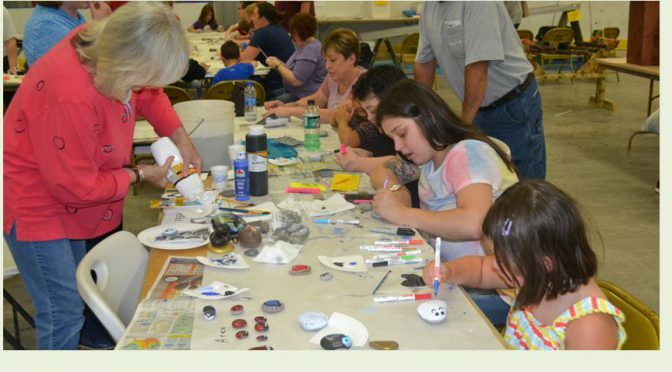 Buckets were filled at three sites, half bushel baskets with crystals encased in red Arkansas mud were purchased, we traded for yet more, and eventually even the spaces under the seats in the van were dedicated to Arkansas quartz. And we hadn’t even headed to North Carolina yet! 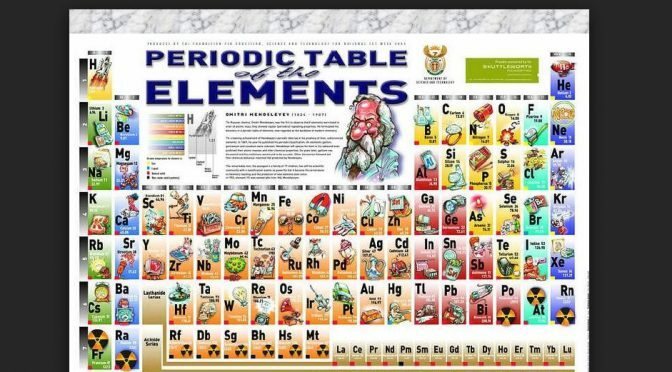 Have you ever sat down to think about where the chemical elements in all those neat minerals we collect came from? I mean in the grand scheme of things, like as the universe forms and evolves. 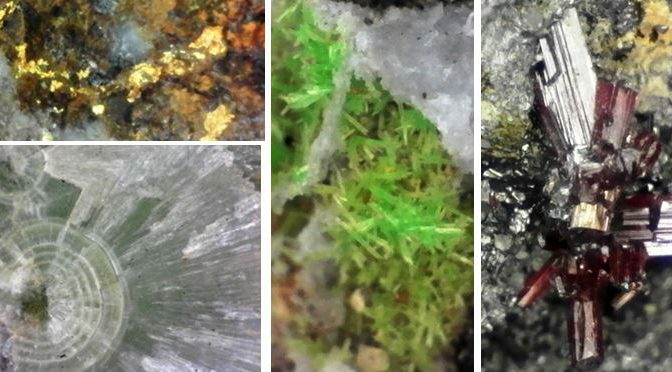 We collect metallic minerals, like copper (Cu) in chalcopyrite and bornite and in colorful carbonate secondary minerals like malachite and azurite. The latter require carbon (C) as does calcite with its calcium (Ca) cation and dolomite when there is sufficient magnesium (Mg). WCGMC has travelled to Cobalt, Ontario in search of silver (Ag) in its pure form as well as cobalt in arsenic minerals (Co, As). 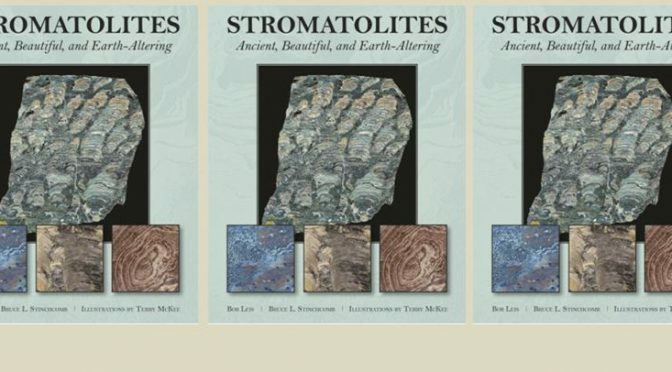 Bruce Leis has been an enthusiastic collector and researcher of stromatolites for over two decades. He has visited them worldwide, photographing their distinctive patterns and studying their geologic setting. 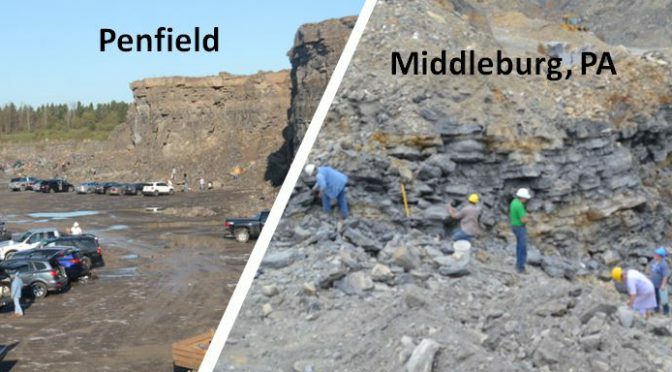 In 2015 he teamed up with retired professor Bruce Stinchcomb and paleo-artist Terry McKee to produce a unique book detailing these wonderful and important geologic features. Anyone interested in earth’s geologic history and the development of life on this planet should enjoy their wonderfully illustrated 176 full page size treatise. Once in a while I like to combine my two primary hobbies, philately (stamp collecting) and mineral collecting. This is “once in a while” version 2017. 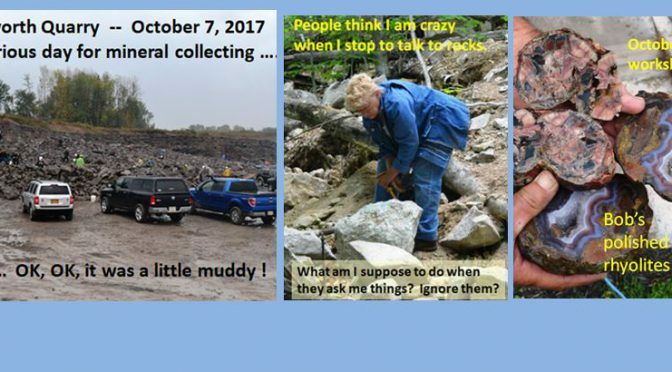 This summer I participated in two separate week-long trips to Ontario to collect minerals: once with the Niagara Peninsular Geological Society of St. Catharine’s, Ontario and once on the annual Wayne County Gem and Mineral Club Canada trip. Now back home and with October baseball on TV, I decided to revisit my mineral finds and pictures from those trips and mix in a bit of philately. This first installment focuses on the historic mining district of Cobalt, Ontario, a site visited on both trips.